Skip to the next post or elsewhere on the web if some juvenile mashup humor is not your cup of joe. These things get said on the web, and it’s almost a reflex I cannot control. Even before I clicked the link to the Big Think short video of Negroponte explaining this assertion, my free form association went to a scene from Star Trek II: The Wrath of Khan. Not to wade too deep into the waters of Star Trek fandom, to me this was one of the most powerful of the post series movies. For many reasons, but the hippie air arrogance of Khan as played over top and then some by Rocard Montlbán. Captain! He put creatures in our brains! I gave a talk at the first TED in 1984 that was two hours long and it had five predictions in it that more or less all came true. And people called them predictions but they really weren’t predictions. They were extrapolations. The reason I talked for two hours is not because I was Fidel Castro and I was giving a rally. It’s because I had 15 years of research stored up and was about to open the media lab and it was real easy to talk about what we were gonna do and some of it even seemed old hat even though in retrospect people thought, oh, this is amazingly predictive. 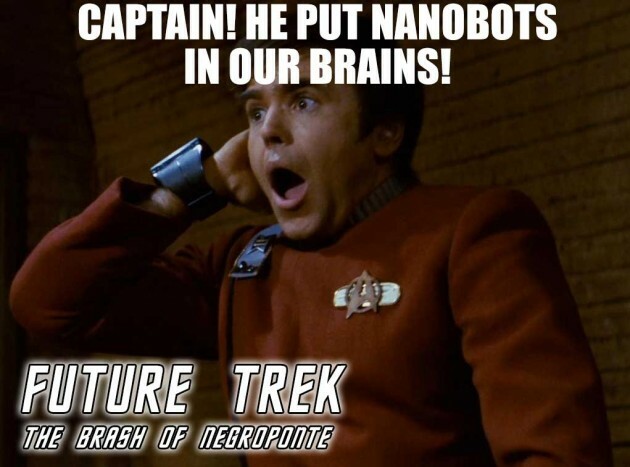 For the nanobots statement Negroponte admits it’s more prediction than extrapolation. At some level it’s not as whacky as it sounds. Not about mind control, but imagine the tiniest of instruments that could go inside the brain and address mis wired connections and such. Because if you inject tiny robots into the bloodstream they can get very close to all the cells and nerves and things in your brain, really close. This is plausible. He could have stopped there, and maybe not have ended up with such a silly headline. Alas no, he went full on, extrapolation set to STUN! And thus the transmission content of teaching is gone, now we have little nano ships of information that will just go depositing “little pieces” of information. All it does is go into the bloodstream. I am no brain scientist, but I do not think learning happens from laying bits of information on it like some sort of red velvet cloak (red as an ensign’s shirt?). The idea of “ingesting information” being translated by Spock’s computer to learning is… well… really whacky. Anyhow, too good to resist. By the way, that is a genuine Federation Classic font, available for free from dafont. It’s not the first time I reached for this movie. I found an image of my MOOC mocking in the moocmocking folder — the sheer irony of KHAN in a movie that opens with a plot point at Starfleet ACADEMY is too much. This is how my brain works, by association across regions, cross linking, and reaching deep into my sarcasm and humor seeking nodules. Can a bot just drop in there like a little crate of information? Maybe it will be teleported there. Sounds exactly like The Matrix. Is this dude Morpheus? Can I learn karate? Avoiding nanobots in bullet time is easy.